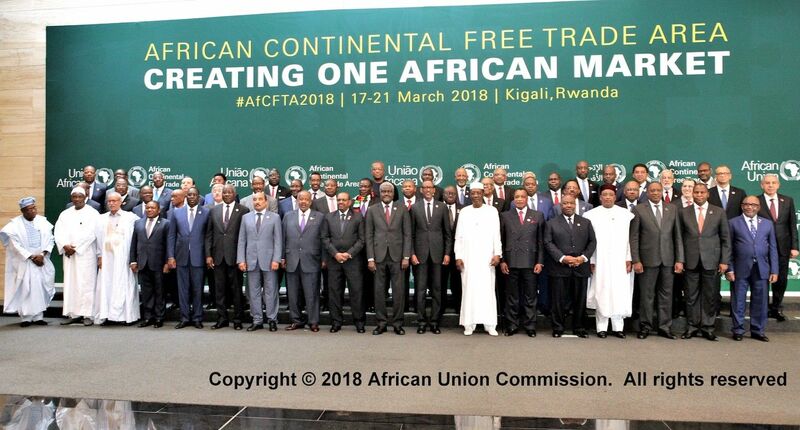 Kigali, Rwanda, 21 March 2018: Close to Fifty (50) African Union Member States have signed the African Continental Free Trade Area (AfCFTA), the Kigali Declaration and the Free Movement Protocol by order of interest, during the official opening ceremony of the 10th Extraordinary Summit of the AU Assembly of Heads of State and Government held on 21 March 2018, in Kigali, Republic of Rwanda. A majority of the African countries signed all the three legal instruments while some signed two and the others signed one of the three instruments. Very few countries are yet to sign the AfCFTA Agreement. (See complete list of the countries and the Legal Instruments they signed during the Extraordinary Summit on the AfCFTA, posted on the AU Website: www.au.africa ). The Summit dedicated to the AfCFTA, was described by the African Union (AU) leaders and Decision makers, as a historic moment in the life of the continent. While the signing ceremony of the legal documents was a solemn event that marked a millstone in the realization of the “Africa We Want” … A dream come true. Another important page in the history of Africa was written with the massive turnout and efficient participation of the African countries who expressed the willingness of materializing the continental development agenda of the AfCFTA as enshrined in Agenda 2063. The Chairperson of the African Union (AU), H.E Paul Kagame, could not hold his excitement in seeing the enthusiasm of all the AU Member State to be part of this giant step aimed at advancing the integration process of the continent. The African leaders all expressed the willingness to facilitate intra-African trade by signing the three legally binding documents and by so doing, created history during the Extraordinary Summit held at the Kigali Convention Center (KCC) in Rwanda. “ I wish to acknowledge all the leaders, past and present, involved in bringing us to this point. We are reaping the rewards, of their foresight”, underlined President Kagame. He added that, the AfCFTA is the culmination of a vision set forth, nearly 40 years ago, in the Lagos Plan of Action, adopted by Heads of State, in 1980. “That understanding led directly to the Abuja Treaty, establishing the African Economic Community, in 1991…they have been the model, and the engine for Africa’s integration” he recalled. The AU Chair appreciated the fact that, this historic signing of the AfCFTA will enhance the dignity and well-being of Africa’s farmers, workers, entrepreneurs, particularly women and youths, as it will create more jobs, bring more investments and prosperity for the continent with the view of prioritizing the production of value-added goods and services, that are “Made in Africa”. According to AUC Chairperson Moussa Faki, the world is changing, and changing at a great speed. International competition is fierce. It leaves no room for the weak…These last few months have, indeed, demonstrated the urgency of hastening the pace. “For Africa, after decades of independence, marked by persistent under-development and a marginal place in the international system, the terms of the debate are laid down in almost Manichean terms: Unite or Perish, as Kwame Nkrumah said at the Addis Ababa founding Summit”. Said the AUC Chairperson. He added that “Economic integration thus responds not only to aspirations born out of Pan-Africanism, but also to a practical imperative linked to the economic viability of the continent”. “Consequently, the convening of this extraordinary session of the Assembly has raised great expectations across the continent. Our peoples, our business community and our youth, in particular, cannot wait any longer to see the lifting of the barriers that divide our continent, hinder its economic take-off and perpetuate misery, even though Africa is abundantly endowed with wealth”. Emphasised Mr. Faki. He further noted that, “outside the continent, our efforts are observed with a mixture of admiration and scepticism….This Summit must, therefore, mark a break. It must strengthen the confidence of our peoples in their Union and its ability to fulfil their aspirations. It must confound those who, outside Africa, continue to think, with barely concealed condescension, that our decisions will never materialise”. « The task ahead is great indeed, and heavy is the responsibility; and yet it is a noble and glorious challenge - a challenge which calls for the courage to believe, the courage to dare, the courage to do, the courage to fight, the courage to achieve - to achieve the highest excellences and the fullest greatness of man. Dare we ask for more in life ». Mr. Moussa Faki Mahamat said, “This address has particular resonance as we gather here in Kigali. We need to summon the required political will for the African Continental Free Trade Area to finally become a reality”. He therefore called on the AU Member States to ratify all the legal instrument signed during this historic moments in Kigali. Worth recalling that H.E President Mahamadou Issoufou of Niger is the Champion who has led the negotiations on the AfCFTA. His peers paid tribute to for the dedication with which he led this process. (See complete speech of the AUC Chairperson on the AU website: www.au.africa ). The event took place in the presence of H.E Thomas Kwesi Qwartey, Deputy Chairperson of the, the Commissioners and officials of the AU Commission, the representatives of the AU Organs, the RECs, and invited guests. The Legal Instruments signed by the AU Member States were handed over to the Chairperson of the AUC, as custodian of the AU treaties and archives..